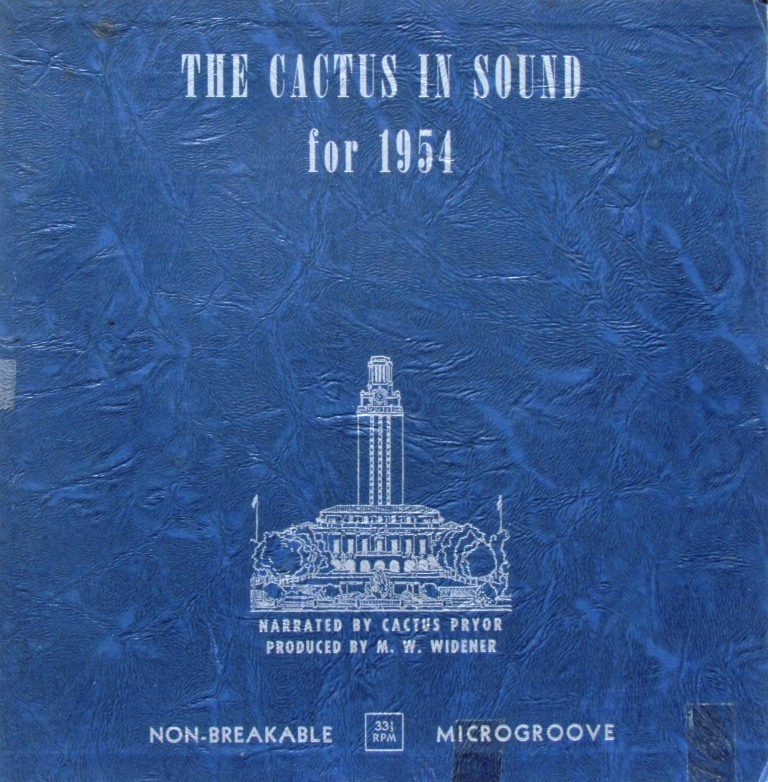 Above: The Cactus in Sound for 1953 – 1954. Listen here. In 1953, the Cactus yearbook staff decided to try an experiment. Instead of documenting the academic year only through photographs, what if the Cactus created a sound archive as well? The staff recruited Richard “Cactus” Pryor, then a UT alumnus and well-known humorist and radio personality, to serve as narrator, and promptly set out to record some of the highlights of the school year. A formal album – an “audio yearbook” – was produced and sold for $6.00, but the recording wasn’t as popular as the staff had hoped. The 1954 edition was the only one. Today, though, it provides us with a few precious glimpses of campus life at UT over sixty years ago. 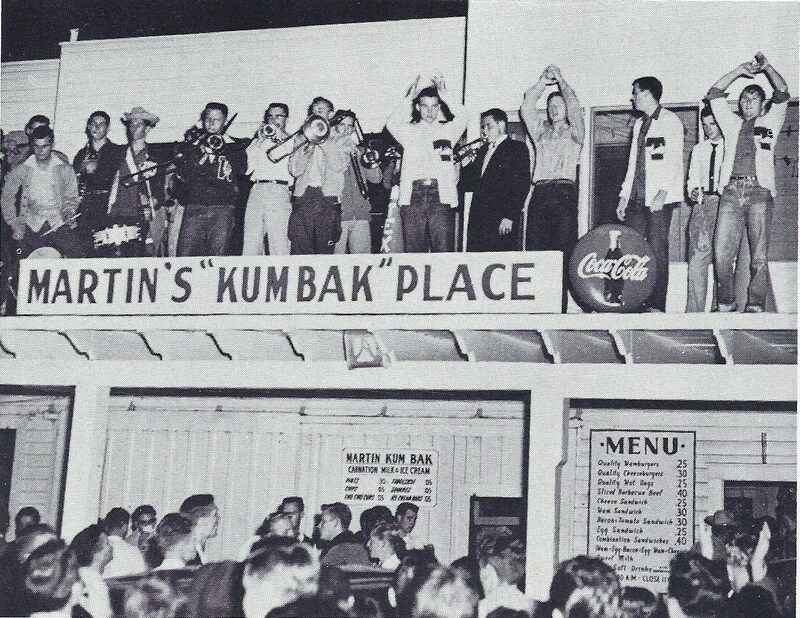 Above: An unofficial football rally staged at Martin’s “Kumback” burger restaurant. The first football rally of the 1953-54 school year, held in Gregory Gym. Some of the yells here are no longer heard on the campus. The inauguration speech of Logan Wilson, installed as President of the University of Texas on October 29, 1953. Selections from “Time Staggers On,” an annual musical spoof on campus life that was a popular 25-year UT tradition. Highlights from the annual Round Up weekend, originally a spring homecoming with parties, dances, performances, an elaborate parade through downtown Austin, and the announcement of the UT Sweetheart. 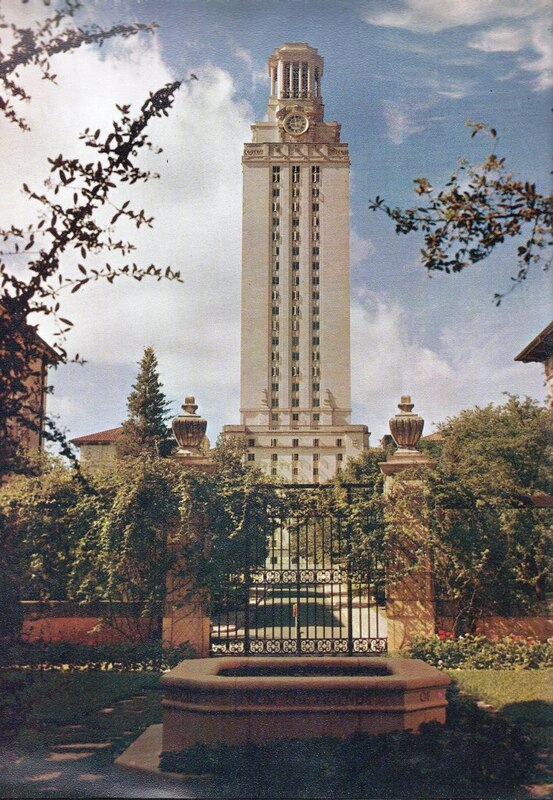 The UT Tower chimes play “Home on the Range” and “The Eyes of Texas” before marking the hour at 1 p.m. Listen to the 1954 Cactus in Sound here! You can also find it under the “Audio” menu on the UT History Corner. Above: The Main Building and Tower in 1954 as viewed from Mary Gearing Hall.